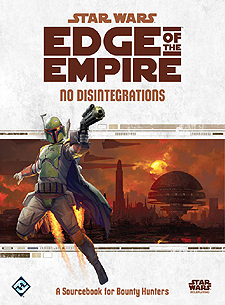 No Disintegrations expands on the Edge of the Empire Roleplaying Game, adding new content for Bounty Bunter characters as well as for any other characters interested in pursuing bounties. Track you quarry through any environment, conduct detailed investigations into the galactic underworld, and devastate your foes with peerless precision. Expanded character options including Motivations, Obligations, species, and specializations. New signature abilities that allow Bounty Hunters to chase down any prey and unload their entire arsenals into their enemies. Ships, vehicles, and equipment for the pursuit of sentient beings. Rules and guidance for GMs covering investigations, rewards for Bounty Hunters, and integrating Bounty Hunters into their campaigns.